Every technology services company wants to build its consulting practice, but are they right to do so? It sounds like heresy. With digital transformation consulting work growing by almost 20%, technology services companies—and here I’m talking about firms that develop, implement and integrate software systems, as well as those that provide outsourced IT services—would surely be mad to ignore the opportunity that’s sitting on their doorstep. 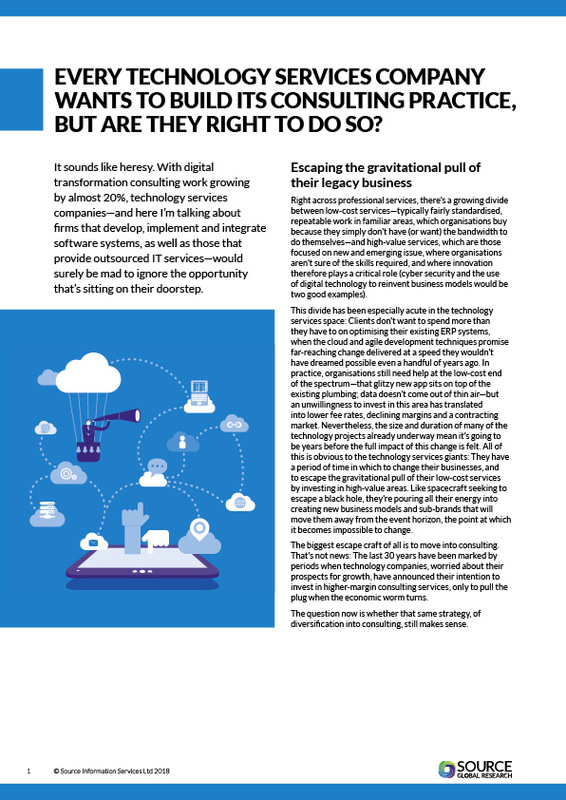 Right across professional services, there’s a growing divide between low-cost services—typically fairly standardised, repeatable work in familiar areas, which organisations buy because they simply don’t have (or want) the bandwidth to do themselves and high-value services, which are those focused on new and emerging issues, where organisations aren’t sure of the skills required, and where innovation therefore plays a critical role (cybersecurity and the use of digital technology to reinvent business models would be two good examples). This divide has been especially acute in the technology services space, and the biggest escape craft of all is to move into consulting. The last 30 years have been marked by periods when technology companies, worried about their prospects for growth, have announced their intention to invest in higher-margin consulting services, only to pull the plug when the economic worm turns. The question now is whether that same strategy, of diversification into consulting, still makes sense. Please login to gain access to the rest of this free white paper.